The Cavour White Glass Desk is a simple, modern design that is perfect for any contemporary home office, study or bedroom. The desks smooth white glass table top combined with its white legs give this desk a bright and fresh look, adding a wonderfully modern feel to your home. The skeek 8mm TSG tempered safety glass desk top is strengthened and scratch resistant, making it both safe and very durable. The Cavour desk is 77.5cm in height, 65cm in width and 125cm in length. This practical sizing makes it an ideal size for a small home office or study area. 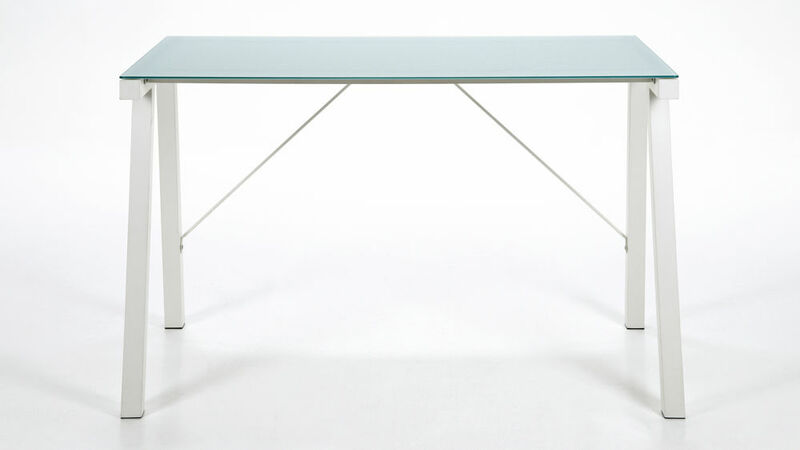 The sturdy metal legs are finished in white lacquer to give a modern and contemporary feel to this white glass desk. This piece will instantly add a bright and fresh feel to your space. Whether you are just surfing the internet, tackling a work project or stressing over a university assignment, this sleek and clean cut modern glass desk will be right for you. If you are after something a little chunkier in design, we suggest taking a look at our Fern White Gloss Desk.